When you turn back your clocks by an hour on November 5th for daylight savings time, make sure also check the batteries in your smoke alarms. The Government of Canada’s Public Safety website states that eight people die in home fires each week. Home fires make up 40% of all kinds of fires and account for 73% of all fire deaths. With a smoke alarm, says the Ontario Association of Fire Chiefs, your risk of dying in a fire is reduced by nearly half. 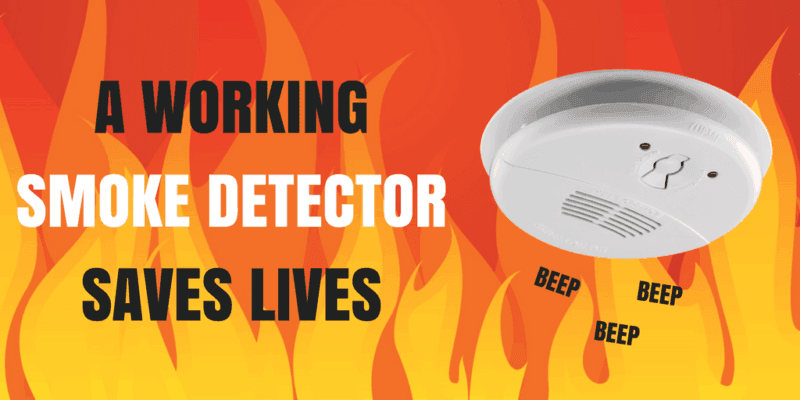 Investigations into house fires often find that smoke alarms were not working or have been disconnected. As many fires occur at night when people are sleeping, the smoke may not wake you up. A working smoke alarm can keep you from perishing in a fire. According to the Canada Safety Council, you need to have a smoke alarm on every level of your home. In fact it is the law for all home in Ontario to have smoke alarms on every storey of the house and outside of all areas where people sleep. The Ontario Association of Fire Chiefs recommends that alarms be installed on the ceiling. This is because smoke rises. Always install the alarms according to manufacturer’s directions. The National Fire Protection Association also notes that with modern furnishings, fire can spread very rapidly, much more quickly than in the past when more natural products were used in manufacturing. Ionization Smoke Alarm; This alarm uses a small amount of radioactive material to ionize the air between two electrically charged plates, causing a measurable current to flow between plates. When smoke enters the alarm, it changes the flow of current, which is detected and activates the alarm. Photoelectric Smoke Alarm: This alarm uses a light source aimed away from a sensor in a sensing chamber. When smoke enters the chamber it reflects the light onto the sensor, which activates the alarm. It is best to test your smoke alarm monthly to make sure it is working properly. Follow the manufacturer’s directions for cleaning the alarm and changing the batteries. It is recommended that smoke alarms that are more than 10 years old be replaced. It is also important that everyone in the household recognizes the sound of the alarm and that everyone knows the pre-planned escape plan. If a fire occurs in your home, getting out as quickly as possible is critical. Having a planned escape route out of your home can save lives. Gather everyone in the home together and determine the best ways to escape in case of fire. It is recommended that you draw a floor plan and map out two ways to escape. Also decide on a meeting place outside of the home where everyone can gather after leaving the home. Equally important is practising the escape plan. Pretend there is a fire and get everyone to go through the drill. Make it as true to the real thing as you can. Pretend the lights are out and smoke is in the air. Be sure that everyone in the home knows how to and is able to unlock and open windows and doors. If you live in a high-rise, use the stairway to escape. Do not use the elevators. If you are escaping from the second storey of a home, pre-determine how everyone will reach the ground safely. Make special exit plans for children, older adults and people who have disabilities. Close all doors between you and the fire and do not open a door if it is hot. Stuff the cracks around a door with towels or bedding or similar items to keep smoke out. Keep low and crawl when exiting. Deadly gases will be in the smoke and hot air rises. The ‘cleaner’ air will be near to the floor. Do not stop to rescue pets or gather any of your belongings. Saving lives is more important. Every second counts. Never go back into a building that is on fire. Firefighters are trained to deal with fires and to save people. Morison Insurance is interested in your safety. Call our home insurance professionals at Morison Insurance today at 800-463-8074 or contact us at [email protected] to discuss your home, auto, business, farm, recreational home and vehicle, life and other insurance. If you have it we can insure it AND we will arrange a consultation and review your current policies. With Morison Insurance, you’re covered.